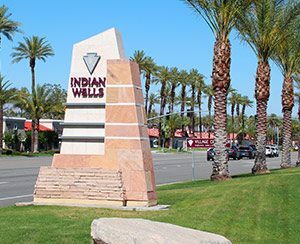 Indian Wells is a city located in Riverside County, California, and within the Coachella Valley. The city was incorporated in 1967 and it lies distinctly between Palm Springs and La Quinta in the Coachella Valley. In the United States census that was conducted in 2013, the population of Indian Wells was reported to be 5,165. Starting in the late 1940s real estate around the area that was to become Indian Wells became profitable. This laid the foundation for the opening of 2 large country clubs in the area; The Eldorado Country Club and the Indian Wells Country Club. Both Country Clubs opened in the 1950s and they attracted tourists in their droves. Among the most notable visitors was President D. Eisenhower who eventual became an Eldorado homeowner. Over the years, Indian Wells has evolved into something of a tennis haven. With the addition of the $77 million dollar Indian Wells Tennis Garden in March of 2000, Indian Wells became a world player in tennis circuits. Currently, the city hosts the fifth-largest tennis tournament on the planet; the Indian Wells Masters tennis tournament (although presently, it is officially known as the BNP Paribas Open). The Indian Wells Masters is currently one of the nine ATP World Tour Masters 1000 events, all of which are owned, run, and operated by the Association of Tennis Professionals. It is also one of the WTA Premier Mandatory tournaments of the Womens’ Tennis Association (currently, there are four of them). It is an annual event, which is held at the Indian Wells Tennis Garden; a location that boasts the second-largest stadium in the world that is dedicated to tennis alone. Homes and condos in Indian Wells attracts luxury homebuyers from around the globe. With some of the most prestigious country clubs in the nation, Indian Wells home often fetch a higher sale price than surrounding areas. Along with the beauty of this pretty little resort city, Indian Wells also offers residents access to some truly amazing city amenties. Residents of the city are able to access, with proof of full-time residency, the fitness facilities, discount on dining at the clubhouse and discount on golf at the Indian Wells Country Club. While homes in Indian Wells sell for higher prices than other cities in the Coachella Valley, this expense can be justified by the beauty, amenities and prestige that come along with an Indian Wells address.